My English teacher had given us a low-down about Fitzgerald (and Zelda): the fame, the Jazz Age, the alcoholism, living in France, Zelda's mental breakdown. For a seventeen-year-old who desperately wanted to be a writer, their stranger-than-fiction life story really spoke to me at that time, as did Gatsby, the only novel of his I've read to date, and his concerns about being a popular writer versus being a very literary writer. I loved Gatsby. Soon after, I read a volume of The Short Stories of F. Scott Fitzgerald--Scott wrote a ton of shorts throughout his career. The short stories paid his bills. Then I read a biography. I'd never done that with an author before. 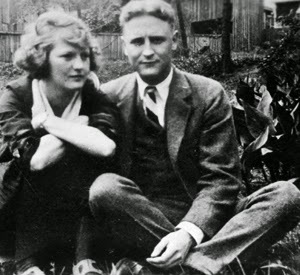 Z is a fictionalized biography of Zelda Fitzgerald, who was an artistic person in her own right. I'm glad she's been given more attention recently; I don't think anyone can say what their life together really was like, except that it wasn't the healthiest of relationships. The Crack-Up was a collection of essays Scott wrote in about 1936, published in Esquire magazine, about his fall, as he saw it--he was an alcoholic, he was running out of money, his health wasn't great, Zelda was in and out of mental institutions, and his writing wasn't great either. There was also a long section of seemingly random notes (but alphabetized) that Fitzgerald kept in notebooks. I might steal some bits and pieces here and there, but in reality, a writer's notes do not make sense to other people. There were some letters in the book, though, and those I found entertaining--and gained some good writing advice. "About adjectives: all fine prose is based on the verbs carrying the sentences. They make sentences move." "Nobody becomes a writer just by wanting to be one." "A good style simply doesn't form unless you absorb half a dozen top-flight authors every year." Who was your first literary glom or crush? Would you want your random notes published for posterity? I don't know much about him. My teacher didn't actually make us read the book, she made us watch the old movie. I've actually thought about my notes being published before! Like I could sell off an original composition book for charity. Lol! I really liked Mark Twain, he also went broke. You should read it, Krystal! It's short but it's got beautiful prose. Or see the Baz Luhrmann movie with DiCaprio--very faithful to the book, actually. The thing about Fitzgerald was, he was pretty open about his fiction being taken from his life. Oh, did Twain really go broke? I've only read Huckleberry Finn. Ah, those were the good ole days - when a writer could make a living out of publishing short stories :-). Don't know that I agree with Fitzgerald on some of the things he says above, though. I tend to use a lot of adjectives in my writing and although I do understand what he's saying about verbs being the centerpiece, I think a balance of all parts of speech (except words, if you want to count them as parts of speech) makes good writing, although some genres tolerate different parts of speech better than others (like literary writing that tends to move more slowly in place, so there are more nouns and adjectives). I also don't agree with him that a lot of reading cane make a writer form his/her own style. I strongly believe that each writer has his/her individual style and he/she needs to find it himself/herself and you do that by writing and writing and writing, not by reading. Reading helps, but any writer who forms his/her style based on what he/she has read isn't exploring his/her most authentic self. The reason why the verb thing popped out at me is that I tend to use the same verbs over and over and it gets a bit boring. Of course, good writing is more than just the verbs you use, but a strong, precise verb does zip the writing along for me. Now as for reading--I agree with you that writing is the only way to develop your own style, but I've come to realize that, for me, all writing and no reading makes for incredibly painful writing. When I was younger, I used to emulate whichever awesome book/author I'd been reading. In the beginning, writers try on different styles. I did and I would've have ended up with whatever it is I write if not for all the reading I've done.